Summary: This issue continues from CAPTAIN AMERICA #25. We continue to see bearded Steve Rogers struggling to survive in limbo. Meanwhile, back in the real world, Patriot and Giant Man have devised a way to use time travel to send a message through the shield to the heroes trapped in space and through the Dark Dimension bubble to the heroes and citizens trapped in New York. The message is from Sam Wilson promising those trapped that they have not been forgotten and telling them that there is hope in the form of the Cosmic Cube fragment they recovered. They are going to use the fragment to alter reality enough to bring down the shield and the bubble. Sam Wilson takes the Cube fragment into the air between the shield and the bubble. Meanwhile, the other heroes are going to break the rest of the Underground out of Crossbone and Sin’s prison. In space, the Guardians try using a Nullifier Bomb to bring down the shield. It fails. On Earth, Doctor Strange traded away his Sanctum Sanctorum for a spell that would amp up Cloak and Dagger to bring down the shield. It fails. 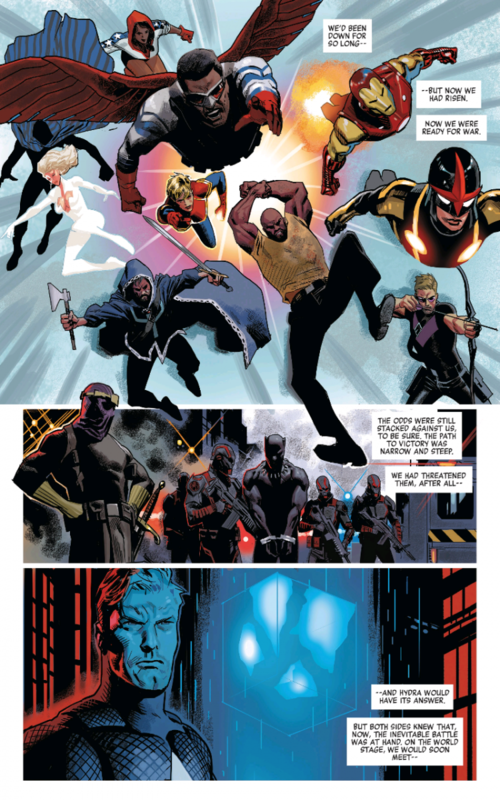 Sam Wilson comes under attack by Hydra forces in the air. He ends up getting shot down. Spencer’s writing tends to have a lot of political overtones to it. I typically enjoy that, but at times, it can make the stories feel heavy handed. This was just a balls to the walls, action-packed comic full of heroes being heroes. We don’t see enough of that anymore. It was also pretty cool that the Cube wasn't just a deus ex machina. It didn't "fix" everything, put it made sure that the pieces were in place to get the ball rolling in the right direction again. I hope that they keep up with that through the last two issues of the series. It would certainly be better than a silly cosmic reset button. Comics should pretty much always be fun, and this issue did not forget that, even when things looked darkest. I will say that I didn’t love the art on this issue. There are four artists credited, and at points it does feel like it was drawn by committee. Some of the action scenes felt really cluttered, and there were a lot of panels without much detail. There are some good art moments throughout, but it just felt very inconsistent. That said, I always lean more towards the writing side of comics than art. When the writing is as good as this comic is, I can accept passable art. 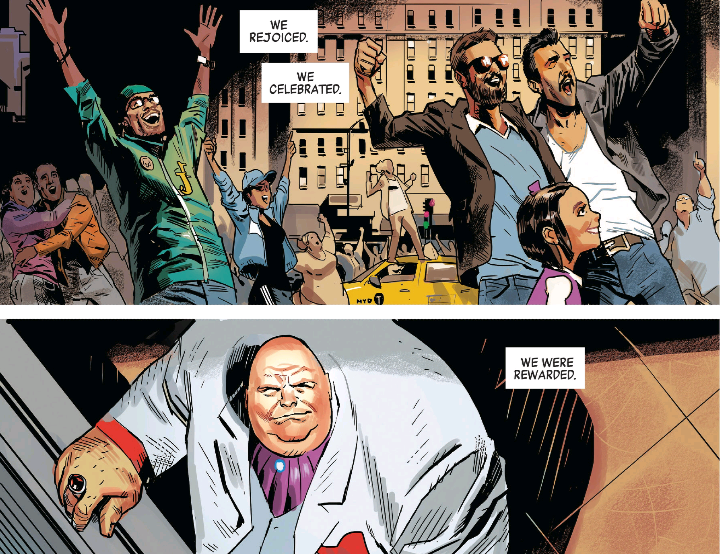 Like I said about CAPTAIN AMERICA #25, this comic felt really special. Everything is moving in a real positive direction with the heroes all rallying together for a final battle led by Sam Wilson. 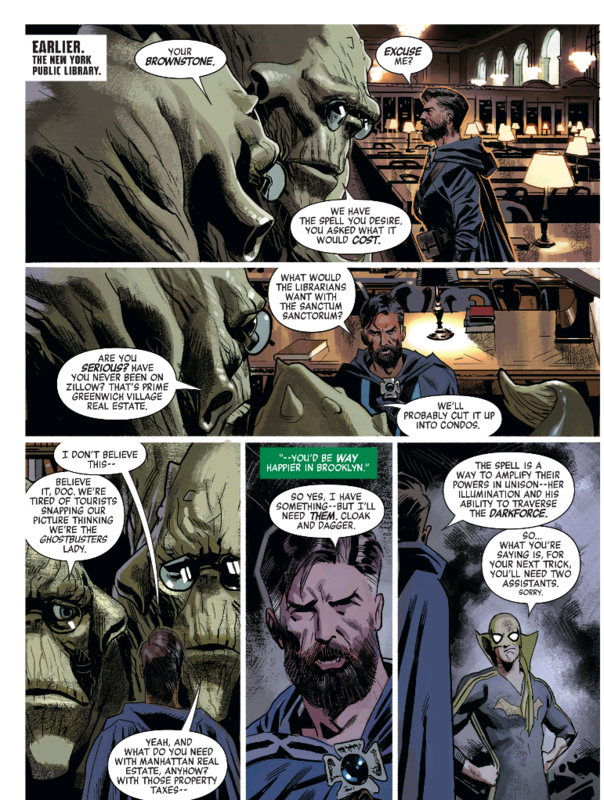 It made me exciting to read the last two issues of SECRET EMPIRE and really curious where Marvel is going to head in LEGACY. A few years ago, it seemed like Marvel was heading in this direction with THE HEROIC AGE, but that sort of fell to the wayside. Hopefully, this time they follow through entirely. Is it worth your $4.99? Definitely. Captain America #25 and Secret Empire #8 are two of the best comics I've read in a long time, especially from Marvel.